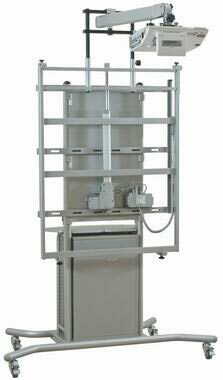 iTeach 2 Mobile Interactive Whiteboard Stand with Short Throw Arm 16" to 22"
Best-Rite iTeach 2 Mobile Interactive Whiteboard Stand with Short Throw Arm 16" to 22"
The iTeach 2 Mobile Interactive Projector Cart lets you take your interactive whiteboard system anywhere in the school! And you can electrically adjust the height for each presenter with the touch of a button. 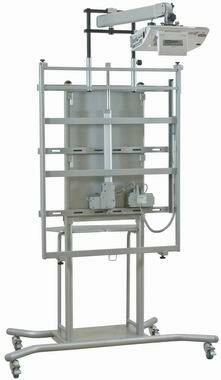 This cart will allow you to mount up to an 8'W x 4'H interactive whiteboard onto it. (not included) The Cart does include an arm for your short throw projector. You may customize your cart according to the type of projector you have. Call us for details. You will be able to project on a vibrant screen without mounting a projector on the other side of the room or permanently attach it to the ceiling via long hidden cables. Simply attach your projector to the arm on your cart for easy mobility! Now you can project your digital images in high traffic areas like libraries or gymnasiums without worrying about space limitations! And because the projector is mounted directly above the screen, it completely eliminates the irritating and distracting shadows when people walk between the projector and the screen forever! 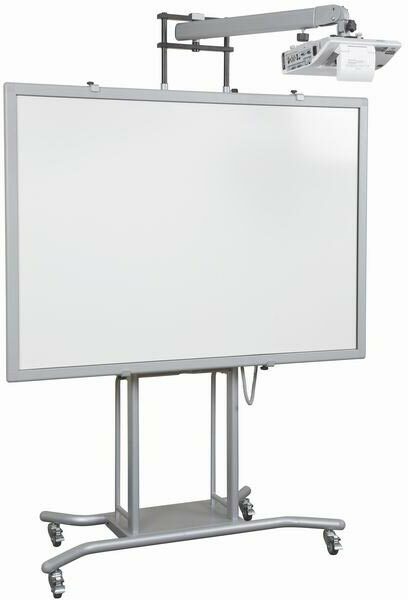 And presenters can finally stand in front of their interactive whiteboard without casting a shadow! The presentation won't be interrupted by shadows and walk bys! Cart includes a 20" electric height adjust to move your board to a comfortable height suitable for adults or children in a flawlessly smooth fashion. Simply use the included wired remote to move your screen up or down as necessary! Meets both ADA requirements and Architectural Barriers Act Accessibilities guidelines. At the rear of the unit is a shelf designed to securely hold a full size PC. Cord management system conceals cords. Add an optional sidewing table to hold your laptop or additional presentation materials. Includes the Short Throw Projector Arm for mounting your short throw projector between 22.5" to 48" away from the board. If your projector is Super Short Throw or Ultra Short Throw, no worries. 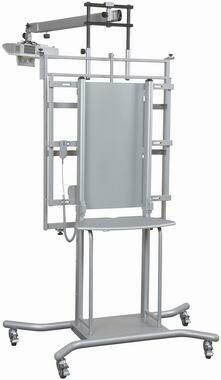 Simply call us to customzize the correct arm for your mobile projector mounting cart! UL-approved electric system smoothly adjusts height by 20"